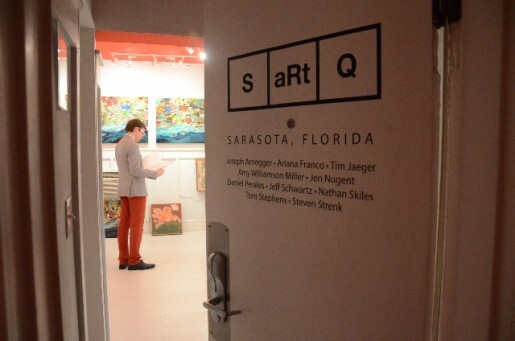 s/ART/q is a group of ten professional artists with connections to the Sarasota area, known for engaging the community through unique art experiences: Joseph Arnegger, Tim Jaeger, Amy Williamson Miller, Jeff Schwartz, Nathan Skiles, Tom Stephens, Steve Strenk, Jen Nugent, Daniel Perales and Ariana Franco. Day 2 – I spoke with Ariana Franco about s/ART/q’s participation at the Select Art Fair. PB: This was s/ART/q’s first time showing during the Miami fairs. Were all of the s/ART/q artists represented in this show? AF: Yes all of the artists were represented. PB: What was the name of the show where you exhibited and please describe how the Catalina Hotel was converted. 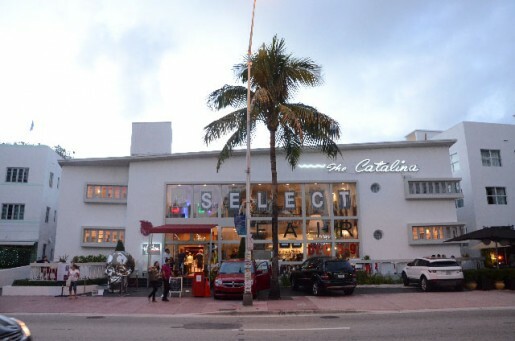 AF: The fair is called Select Art Fair at the Catalina Hotel. The whole hotel was transformed into an art party with a DJ in the lobby in the evenings, artists running around all day and night. 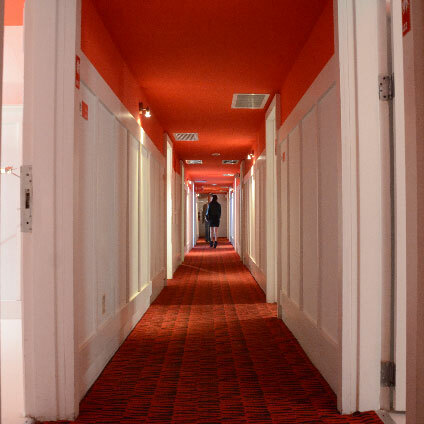 Each guest room was stripped of its usual contents- the bed, end table, phone, television, everything was removed. This left the rooms open for each representative to create a gallery setting. PB: What were the visitors to this show like? AF: The visitors varied. Some people were very interested in the work and asked a lot of questions, which made it fun. Others just walked in twirled around and left. PB: How would you describe the particular energy or spirit of this particular show at the Catalina? AF: The energy was high. So many amazing, happy, excited people were there, both artists and viewers. PB: Can you share any specific interesting experience that happened to you? AF: The most interesting thing that I experienced this year was at Design Miami. I went on Friday early afternoon before working my shift at Select Fair. When I was about to leave, Pharrell Williams was scheduled to talk about his new design book. I managed to stay for long enough to get a photo and a video clip. This was the first time I had seen a celebrity at an art fair. PB: What was your typical day and night like? Typical day…. well, because Jen Nugent and I slept in the space, our mornings and evenings consisted of making the room livable with an air mattress and our personal belongings, and then putting it all into the shower in the mornings so the space was once again a gallery. This particular week/event did not have a consistent flow, besides the mornings and late evenings. I went to as many other fairs as I could and looked at as much as I could handle before it felt like my eyes were going to fall out. PB: How did it feel to sleep in your gallery? Any strange dreams or descriptions to share? AF: The experience of sleeping in the gallery was good. It was a little difficult in such a small space but I enjoyed it. The first night one of the sculptures fell but I slept through it. And we covered the window to create more hanging space for paintings, so it was hard to get up in the morning without the natural lighting. Besides that it was pretty normal. PB: Did you see any work you particularly liked? AF: The artist I really liked was Melissa Jay Craig, who works in paper. The pieces I saw were “Amanita Muscaria” (mushrooms) constructed from handmade paper (by the artist) in book forms. They have a “distinctive clown like appearance” (from the artist’s personal statement). They excited me because they were something you can imagine and believe in both as an adult and child. They contain movement, even though they are still sculptures. They made me giggle, that’s how I knew I liked them. I believe art should evoke a feeling, and they did. I also work in paper, although not to the same extent. 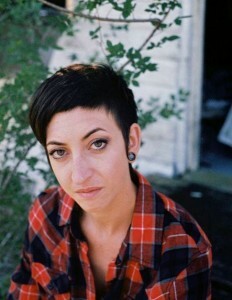 She inspired me to really think about what I’m making and what I want to be making and how to achieve that. PB: Would s/ART/q like to return next year? AF: I am not sure what we want to do next year. On a personal level it was a great experience; I’m sure everyone else would agree. It provided exposure for each of us individually and collectively, representing Sarasota. We haven’t had an opportunity to really talk about the pros and cons yet.